The Evolution Pro SF-B1714 is one of the newest indoor cycling bikes from Sunny Health & Fitness for 2018. Although it’s not sold as a commercial grade trainer and doesn’t come with a commercial warranty, it definitely offers the sturdiness of a gym-quality bike. In terms of specs and construction, it can be compared to the Fitness Reality X-Class 520. However, it doesn’t include a fitness meter. As we’ve mentioned above, the Sunny SF-B1714 features a heavy-duty steel construction with a weight capacity of 330 lbs (150 kg). The bike itself is considerably heavy as well; with the frame completely assembled it weighs approx. 136 lbs (61.6 kg). This weight is quite a plus for its stability though; you can be sure that the bike won’t move or wobble even if you engage in the toughest spinning workouts. On top of that, both the bike’s base bars are equipped with large, adjustable stabilizers. Therefore, you can perfectly level the trainer on any type of flooring. The frame is not foldable. However, despite its weight, it is easy to transport once it is assembled. The front base has two large silicone wheels which facilitate the unit’s relocation. Using a rubberized mat is recommended, though. Due to the bike’s weight plus your own weight, it may cause damage to the floor. A mat is not included with the bike. This Sunny exercise bike isn’t extremely large. With the frame fully assembled, it is approx. 48.5″ (123 cm) long, and 24″ (61 cm) wide. However, it is recommended to leave at least two feet of clearance all around it, so that you can perform any spin workout without any hindrance. Although most of the bike’s frame is constructed out of ovalized steel tubing, there still are several plastic parts. These are the covers of the belt, the side covers of the flywheel, and the caps of the adjustment knobs. But obviously, these don’t affect the bike’s overall sturdiness. The bike’s frame features a corrosion-resistant and scratch-resistant paint. The color used is black for most of the frame. However, the seat post and the handlebar post have a chrome finish. Evidently, despite the rust resistance of the paint finish, this Sunny Health & Fitness exercise bike is for indoor use only. If kept or repeatedly used outside, the screws and other parts may eventually catch rust. One last aspect to mention here regards the step-up bar which connects the seat upright tube and the main oblique tube of the frame. Not only that this bar can help with entry and exit in case the user has to deal with certain disabilities, it can also be used for certain exercises that are part of specific spin workouts. Not all spin bikes have this feature. The seat included with the Sunny Health & Fitness SF-B1714 is quite different than the slim seat present in most spin bikes. It’s thicker, it integrates a consistent layer of plush, and also has a longitudinal groove to promote a healthy blood flow. Differently put, this seat delivers much more comfort than a minimalistic spin bike seat. On the other hand, the seat has a standard connection system to its post. So, in case you want a different one, you should be able to easily find a compatible model in basically any bike shop. The bike’s seat offers 4-way adjustability. Its height offers an adjustment span of approx. 8″ (20.5 cm), while its horizontal slider can also travel a few inches back and forth. The handlebar assembly is also 4-way adjustable. It’s designed for multiple grips with a unified aero bar in the middle. It’s urethane-dipped, so it provides a secure and comfortable grip. These being said, the Sunny SF-B1714 can accommodate users between 5’0″ – 6’5″ (153 – 196 cm) with no problem. The adjustment knobs are fairly large, easy to grip, pull, and turn. Thus, if several persons use the bike, re-adjustment shouldn’t take more than 1 minute. The most important element of the bike’s drive system is the flywheel. 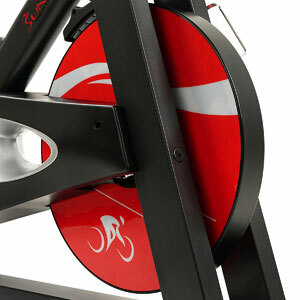 The Sunny Health & Fitness Evolution Pro bike features an extra heavy flywheel, weighing 44 lbs (20 kg). This flywheel has a slightly different construction than other Sunny bikes, such as the Sunny SF-B901 or the Sunny SF-B1516. It’s still perimeter weighted, though, designed for an aggressive inertia. It delivers a consistent momentum, thus, the bike may not be a good choice for users with knee problems or other related disabilities. Needless to say, the flywheel is bi-directional. This means that you can pedal in reverse if you want. However, unlike road bikes, or other types of trainers with a more sophisticated drive system, you cannot coast on this bike. The pedals continue to move for as long as the flywheel is spinning. 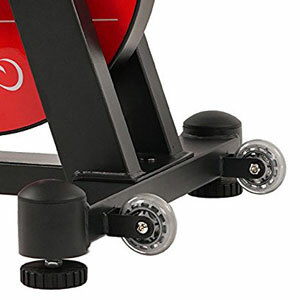 Also, due to the considerable weight of the flywheel, it is recommended to use the emergency brake to stop rather than use your feet, whenever you want to dismount or change the way of pedaling. This exercise bike is equipped with a belt drive system. It uses a 1590 PK5 heavy-duty belt. This belt drive comes with several advantages. One, you don’t have to lubricate it. Two, it generates less vibration than a chain. And three, the pedaling motion is almost silent. The crankset is also an important element in the construction of a spin bike. 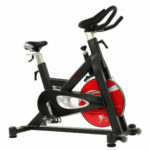 This Sunny exercise bike features a highly durable crankset with solid steel crank arms. It can definitely hold the entire weight of the user as long as they don’t exceed the specified maximum weight capacity (330 lbs). The included pedals are also very durable, made of metallic alloy. They’re equipped with toe cages and adjustable straps, but do not integrate clips for SPD shoes. They’re replaceable, though; they feature standard 9/16 threads, so you should easily find compatible SPD models. One last aspect to mention here regards the bike’s Q-Factor (spacing between the pedals). The Sunny SF-B1714 features a narrow, 122 mm Q-Factor. This is quite a plus, due to the fact that your feet are positioned on the pedals naturally. Thus, you won’t experience any extra lateral stress on the knees or ankles. One of the reasons the Sunny Health & Fitness Evolution Pro is a bit more expensive than other models is its magnetic resistance system. 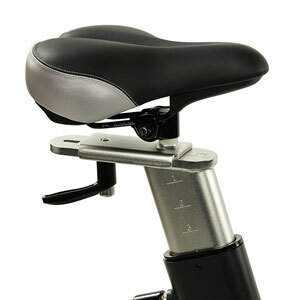 Its brake consists of a magnetic pad attached to the turn-knob on the main tube of the frame. By turning this knob, the magnetic element changes its position in relation to the metallic flywheel, increasing or decreasing tension. The brake is adjusted manually. You simply turn the knob left or right. You don’t have to connect the bike to a power circuit. The resistance knob doesn’t have any levels or “clicks” specified on it, like most upright bikes with magnetic resistance. You simply turn the knob until you feel that the resistance generated corresponds your training requirements. Since it’s a magnetic brake, its pad doesn’t touch the flywheel, so you won’t have to worry about wear and tear, about replacing it, or about any friction generated noise. Also, since there’s no friction, on a higher resistance setting the pedaling motion is much smoother than for a bike with a felt pad brake. Like most exercise bike, this Sunny model comes partially assembled. The flywheel, the belt, the crankset, and the brake are already in their places. All you have to do is attach the front and rear base bars, the seat post, the handlebar post, the saddle, the handlebar, and the pedals. The task shouldn’t take more than 30 min. All the tools you will need for the assembly come with the box, while the included manual provides clear assembly instructions. The bike is basically maintenance-free. Its drive system doesn’t require lubrication; since it has a magnetic tension system, its brake pad doesn’t require replacement. So, all you have to do for maintenance is wipe the perspiration from the frame if its the case, and periodically look for loose or damaged parts. 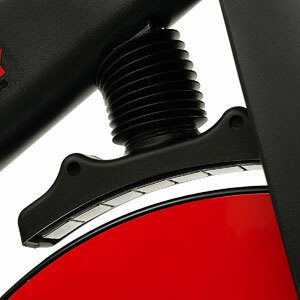 The Sunny Health & Fitness Evolution Pro SF-B1714 is an indoor cycling trainer featuring an extra-heavy flywheel, manual-magnetic resistance, and a heavy-duty construction. It offers superior micro-adjustability (both handlebars and seat are 4-way adjustable). It’s equipped with a plush seat and has a narrow (122 mm) Q-Factor. It’s a perfect exercise bike for medium to intense cardio training, interval training, strength and stamina development, and of course, for weight loss. In terms of price, it’s not exactly one of the most affordable trainers. However, it still costs a few $100s less than other similar bikes. So, as a final conclusion, this Sunny exercise bike definitely offers an excellent value for the price.